Amazon India Is Regularly Arranging The App Only Quiz Time Quiz , Where They Are Giving Away The Free Products Like Free Smartphones , Free Gadgets Etc. 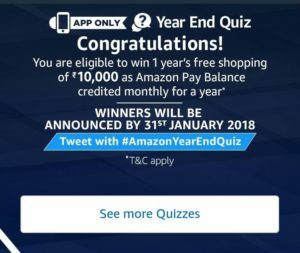 Today Also Amazon India Has Announced New Quiz – The Amazon year end Quiz , Where They Are Giving Away free shopping of rs 10000 for 12 month. 1. Which of these Indian states did NOT have a State election in 2017? 2. Who was declared the President of India in July 2017? 3. Which country won the Hockey women’s Asia cup in 2017? 4. Which is the first Indian film to gross over 2000 crore rupees in all languages worldwide? 5.Who among them did NOT win a Nobel prize in 2017? 6. Which major tax reform was launched in India at midnight, 1st July 2017? 7. In Feb’17, ISRO created history by placing many spacecraft in their orbits in a single mission. How many spacecraft did they launch in one go? 1. This Contest will commence on 14th December from 12:00:01 a.m. (IST) to 31st December 11:59:00 p.m. (IST) (“Contest Period”). 3. 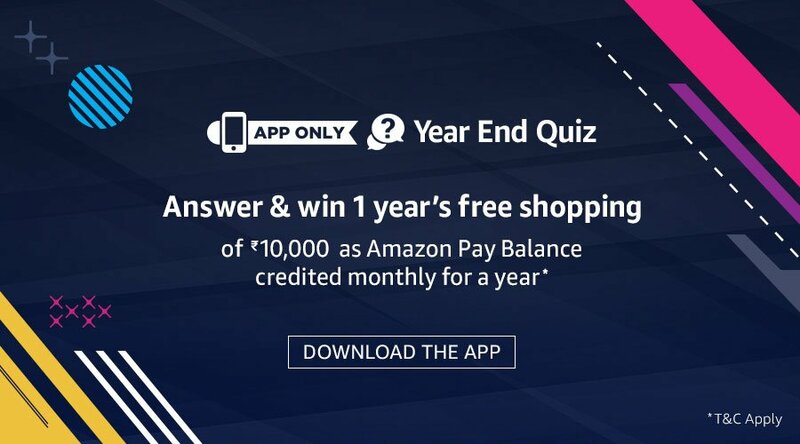 Once you have signed-in to the Amazon.in App, you can participate by navigating to the page where 10 (ten) questions will be posted during the entire Contest Period. 5. The draw of lots will be carried out during the Contest Period for the questions and a total of 1 (one) participants will be selected as winners by a random draw of lots. A total of 1 (one) participants will be selected as winners of the Contest.